Families of the victims of violence in Ciudad Guayana raised their voices against police abuses, in an act of resistance against the situation of citizen defenselessness before the injustices of the state system. Between January and October of 2018 there were more than 600 violent deaths in Ciudad Guayana, whose victims included at least 111 children and adolescents, concluded the Venezuelan Observatory of Violence (OVV), whose annual report placed the Bolívar state in third place. among the entities with the highest homicide rate in the country. 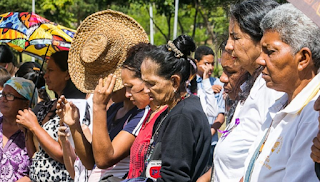 As every year, with regard to the Day of the Innocents, the Foundation for the Sacred Dignity of the Person held a mass officiated by Father Carlos Ruiz, parish priest of the San Martín de Porres church, and a commemorative act for the victims of the violence in Venezuela, which mostly remain unpunished. "It is incredible that no official institution has pronounced on this dramatic figure of more than 111 children killed this year. We also want to denounce that with the false excuse of confrontations or resistance to police action, the security agencies come to any humble home and act with impunity, "denounced the foundation in an interview with Correo del Caroní. The problem is not only crime, but most of the testimonies also have a complaint that coincides with what was revealed by the director of the OVV, Roberto Briceño, during the presentation of the annual report on violence in the country : "The police forces have killed more than the criminals. " On December 27, Mayra Gudelo's brother turned 12 years old after being murdered, a murder that remains unpunished to date. Ensures that "there is nobody in Guyana who has not been a victim of police abuse." He is a resident of the José Tadeo Monagas neighborhood. He said that a young man who had gone to bathe in Macagua, where he used to go, was murdered near his home on March 6. "He was seized by a guard, murdered, decapitated, and after relatives went to Caracas and moved heaven and earth it was found, but that guard is very calm, the river can not be approached because they shoot and kill. They are not only killing us with hunger, they also kill us with bullets, "he complained. "The police bodies get into our houses and steal. They arrive at the houses with gun in hand, they kill the boys, they put a gun in his hand, they shoot them and they say that he confronted, they are executing the young people in Guayana, and they can not be denounced because they see my face and they look for us to kill us, "he added. Increasingly are the testimonies on executions, even by mistake of officials to "confuse" the victims. Another testimony is that of a mother -who asked to protect her identity-, whose husband was murdered a week ago in front of her and her 11-year-old daughter. He said that at approximately 7:00 in the morning two police officers entered the house, firing at doors and windows while they slept. He went to hide his daughter in the bathroom to protect her from the bullets, but was dragged out, naked, and saw that her husband had him kneeling and pointing a gun at him. He received three shots, one of them in the chest, and they kicked him. She also received beatings and verbal attacks. His arms still had the marks of the bruises. They never filed a search warrant for arrest or detention. "They checked the house, they asked me for gold, where the gold was, when my husband and I worked selling clothes and cologne merchandise, and on weekends we sold cupcakes. We divided the money between food and insulin, since my husband was diabetic. " She reported that in addition to killing her husband, her belongings were stolen and the little money she had, as a result of the sale of weekend cakes. These cases have served to increase distrust in the security agencies, they are deprived of reporting for fear of reprisals, and even claim to fear more police and military bodies than ordinary criminals. Glasina Cordero, a member of the foundation, called on government authorities to listen to their claims and justice for the murders, while denouncing the deaths caused by the lack of supplies and medicines in hospitals, malaria and other endemic diseases without an adequate health policy. The Pediatric Center Menca Leoni, by the way, will meet on January 8 nine months since it was closed. The president of the Association of Nurses of the Bolívar state, Maritza Moreno, recalled that the governor Justo Noguera Pietri promised that in three months it would be ready for its reopening, but nothing has been accomplished. As a result, only about 20 to 30 children are treated in an improvised area of the Dr. Raúl Leoni Hospital, which must then be transferred to other hospitals such as Ruiz and Páez in Ciudad Bolívar, or other states.